When you are having snow like on the photo above and you own just a regular passenger car you possibly risk not to leave your house for days or weeks while they be able to clear the way up to your gate. 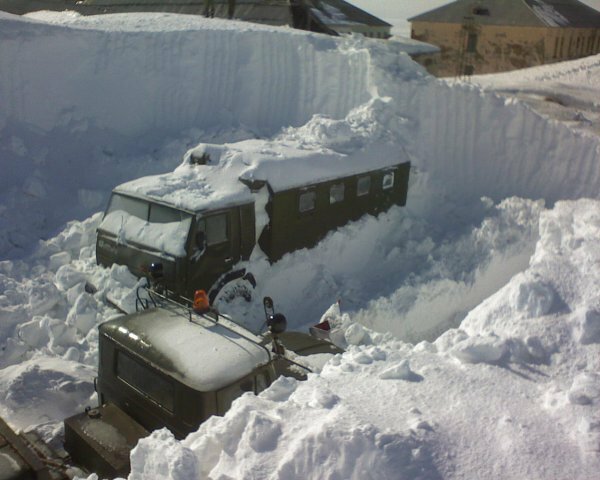 But, there is a solution offered by some company in Kirgizia how to turn any regular car into powerful “Snow-Foot” vehicle. Inside the post after some more extremely snowy landscapes we’ll see the photos and the videos of that cool vehicle idea. I’m amazed that little thing can even turn the wheels. A better idea is to leave the area and move to the Black Sea! 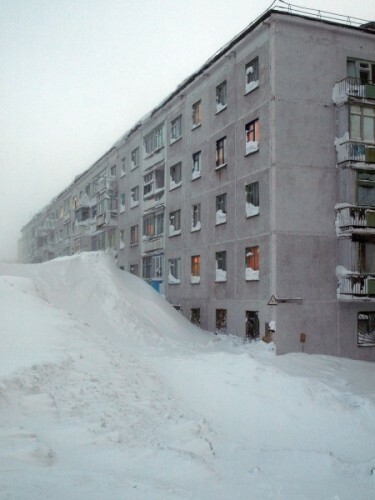 Who needs 12 meters of snow? I wish someone had a solution for EnglishRussia forum that still does not work properly. 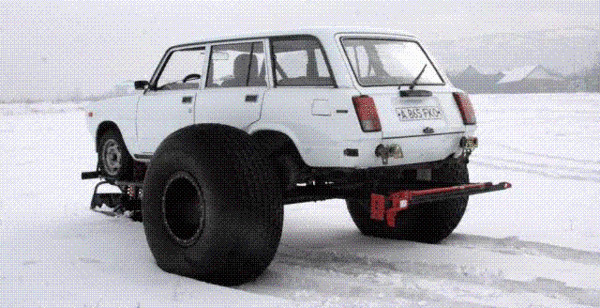 I would think that the gear ratio needed to turn that size wheel would amount to more than that Lada could swing. If you had low range maybe, and hardish snow. 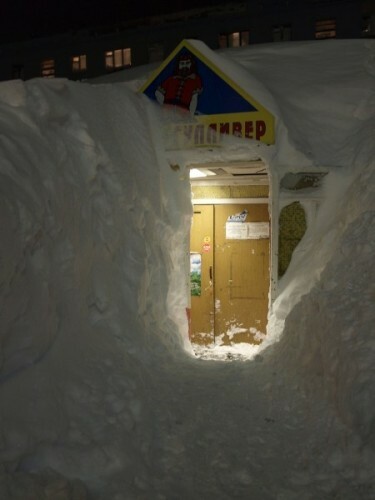 Are there any frikkin’ snowmobiles in Russia? Like Ski-Doo, Polaris? If you got thrice of the perimeter (on the big tire) and the third part of angular speed (rpm) your final ratio will be 1:1. But yes, the momentum (inertia) involving the whole thing can damage your clutch or even the gearbox/diferential. Probably it needs a smooth/gentle driving to avoid damage. Anyway finally Kirghiz stuff! Please more Central Asia! 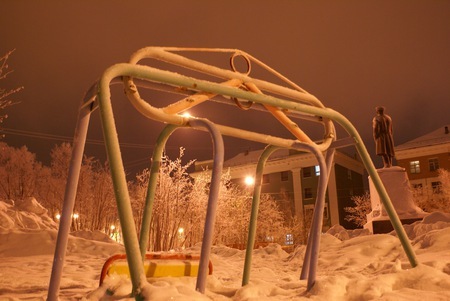 Oh and it’s a good idea, but some local factory in Bishkek/Osh needs to make the design more stronger and reliable. Also, why can’t some of that inclement winter weather happen here? 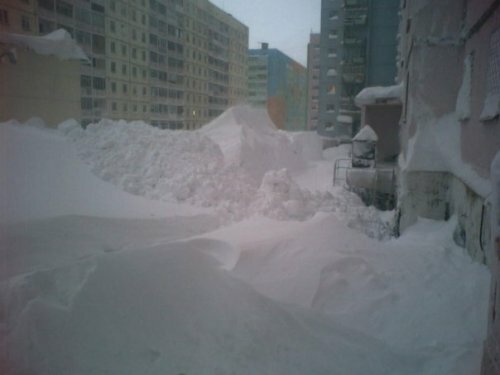 People could build some kick a$$ snow forts and have one Hell of a [email protected] fight with that much snow! I notice they don’t show it turning much, too… and when it does, it looks like it could be outmaneuvered by a container ship. Hmmm… Show, I’ve never seen it, except in refrigerator, In India where I stay it burns like hell in Summer, and Sun shines so brightly that it’ll burn your eyes and skin…I’m sick of heat and I like to see Show! I want to live in a street like shown in photo#3 It should be a fairy tale experience! So ähnlich sieht es bei mir zu hause auch aus! the biggest problem of this rig is that it’s easy to flip – the center of weight is too high, plus the double suspension. 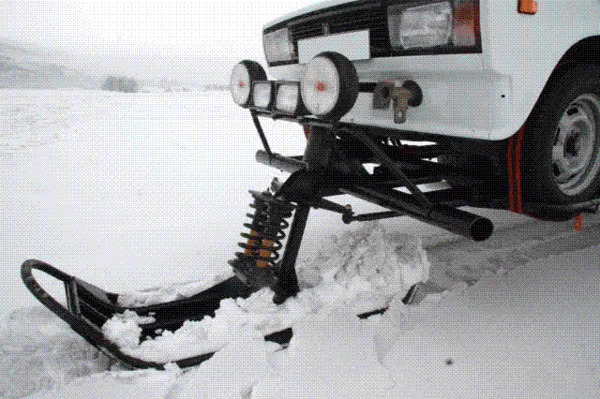 If you hit a bump while turning, your Lada will make friends with the snow. about the gear ratio – Did you see that the cogs mounted to the axles are a lot smaller than those cogs mounted on big wheels? 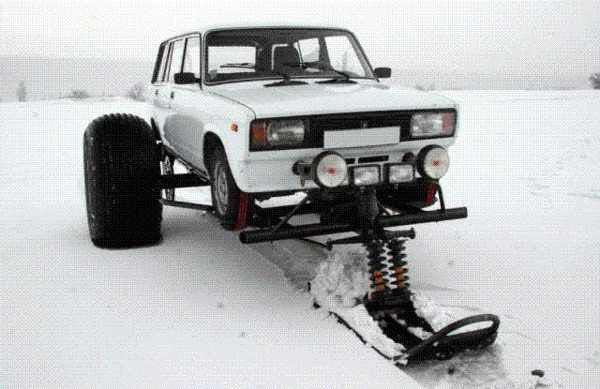 It makes no damage to lada’s clutch or transmission (which are a little too weak even with stock wheels 😀 ). Anyway, nice idea, i would make myself something very similar if i lived there. thanks for sharing. Carrying out some exploring and observed your web site seems a little messed up in my K-meleon world wide web browser. But thankfully hardly anybody uses it any lengthier but you may well desire to appear into it.